Everyone is aware of how some bird species are quite evident and others are incredibly reclusive and difficult to note. This difference extends into most natural habitats that the birds use, especially forest habitats where birds can find lots of different places and ways to avoid detection. Birds are somewhat uniform anatomically, however, there are about ten thousand existing species, each with some distinguishing features, showing how feathers along with other features can make such a large number of distinctions which serve to fit ecological niches for feeding, defense and predator avoidance, migration, compatibility with the elements, and reproduction. 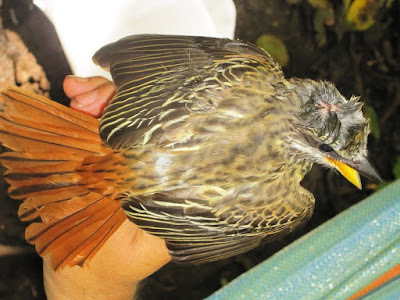 We have conducted several cycles of mist netting studies of the birds of Laguna de Apoyo Nature Reserve in Nicaragua, where there are tropical dry forest habitats facing several levels of human intervention. We have noted how several species of birds can be found commonly in one of our study sites but rare or almost not at all in another site of different vegetation structure and composition. The following are a sampling of the migratory birds that appear in our nets in our studies. Indigo Bunting (Passer cyaneus) males are not nearly so spectacular on the wintering grounds as they are during breeding season. Photo Pier-Oliver Boudreault. This remarkable partitioning of the habitats of the reserve is also noted among migratory birds. About a quarter of all the bird species found in Nicaragua conduct well-defined, seasonal migrations, in which nesting occurs in a northward habitat during the North American summer, and leaves the area along with most or all the birds of the same species southward for several months, once the chicks have hatched, fledged and gained independence. The birds remain in a southern habitat until time to return to the nesting grounds again. 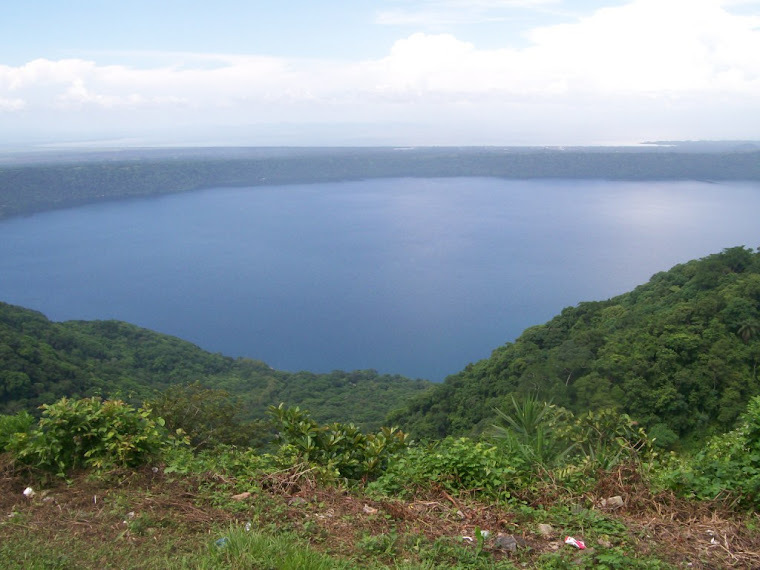 Laguna de Apoyo Nature Reserve offers winter habitats to many migratory bird species which nest further north. 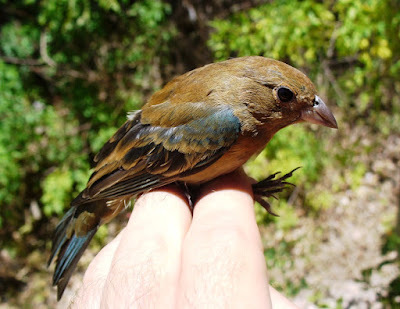 One example is the Indigo Bunting (Passerina cyanea), which nests as far south as extreme northern Mexico, but all the birds of this species disappear move southward into a range extending from central Mexico , the southern tip of Florida, throughout the Antilles and to Panama. The male Indigo Bunting is appropriately named for its attractive, practically solid blue coloration exhibited during reproduction. 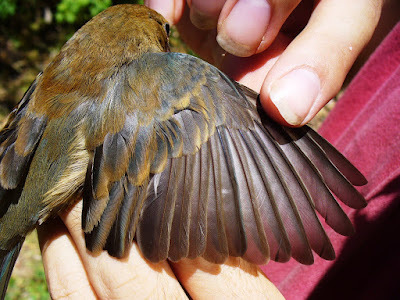 A feather molt in the fall, however, leaves the males with mostly drab, brown color, with some deep blue highlights. Hence, the male Indigo Bunting only uses the bright colors during reproduction and maintains a muted appearance when in Nicaragua, which may be driven by predator avoidance and possibly direct physiological costs to produce and maintain the bright plumage. The female Indigo Bunting is never brightly colored, and lacks the blue wash seen in the male when not in reproductive plumage. Many bird species use color dimorphism in which males demonstrate their reproductive fitness with bold colors and plumage as secondary sexual characteristics which the females use in mate selection. Presumably, a male which will sire offspring more successfully will also have a nice wardrobe. This male Indigo Bunting is an adult with well-developed flight feathers, with rounded tips. Photo Pier Boudreault. 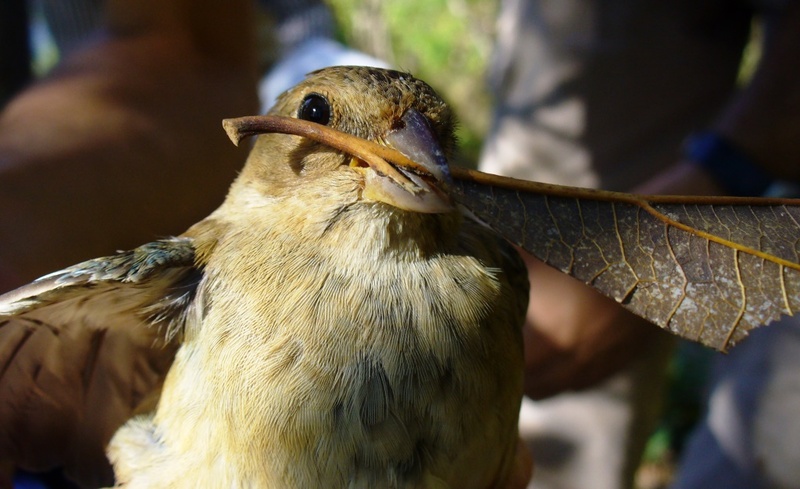 This female Indigo Bunting insisted on a fight so she got one-with the stem of a leaf. Photo Pier Boudreault. As a seed-eating species, the Indigo Bunting is generally found in open areas, where grasses may be found around large trees for perching and refuge. This species is found less often in the deeper forest. In contrast to the Indigo Bunting, the Black-and-White Warbler (Mniotilta varia) feeds on insects found on the bark of trees, especially on the trunk and vertical limbs. It prefers more closed forest canopy and tends to stay low in the forest, climbing along on the trunk, then flying to another, nearby tree to land on the trunk and continue foraging. Its plumage is by no means camouflage for the bird, and there are more bold patterns on the male than on the female, in obvious use in mate selection. Like the Indigo Bunting, the Black-and-White Warbler breeding range, in eastern US and Canada, does not overlap with its winter range, which encompasses the extreme southern US, Mexico and Central America, and the Antilles and extreme northern South America. 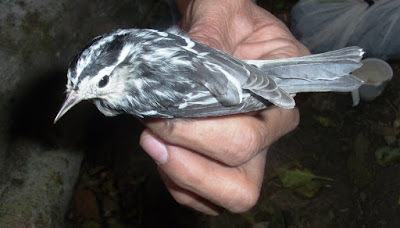 Female Black-and-White Warbler. Photo Vera Neumann. Another group of migratory birds which spend winter in Laguna de Apoyo Nature Reserve are found in the thrush family (Turdidae). 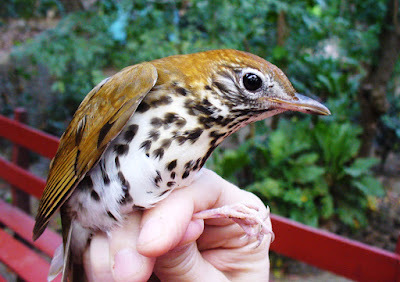 In its breeding range, the Wood Thrush (Hylocichla mustelina) is known particularly for its haunting song, which is not given on its winter range. How fortunate are those who hear its song, for as Henry David Thoreau wrote, "wherever he hears it, it is a new world and a free country, and the gates of Heaven are not shut against him." Unlike the other two birds mentioned above, there are no significant differences in plumage between the sexes in this species. 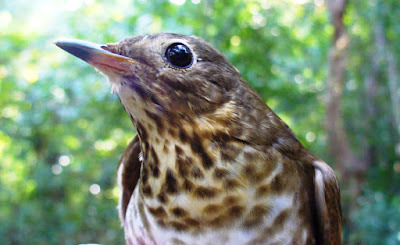 This species can be found foraging on the open ground beneath the shade of large trees, in similar actions to the common resident Clay-colored Thrush (Turdus grayi). Wood Thrush. Photo Pier-Oliver Boudreault. Less striking in appearance is another migratory thrush: the Swainson's Thrush (Catharus ustulatus), which is common in shaded areas in the Laguna de Apoyo Nature Reserve. Like the Wood Thrush, the sexes are similarly colored. Its muted color pattern may be of great advantage, especially when foraging on the ground, as it provides an even greater degree of camouflage than the Wood Thrush. The breeding range, across much of the US and Canada, is completely abandoned by this species during the winter. Birds from the western US and Canada pass the winter from Mexico into Costa Rica, whereas birds from the eastern US and Canada migrate across the Caribbean to Panama and South America for winter. 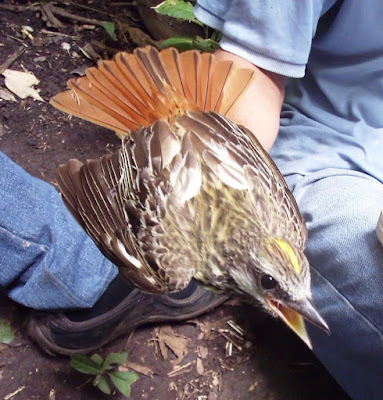 The Swainson's Thrush (Catharus ustulatus) is frequently captured by mist nets in appropriately shaded habitats in Laguna de Apoyo Nature Reserve. Photo Pier-Oliver Boudreault. 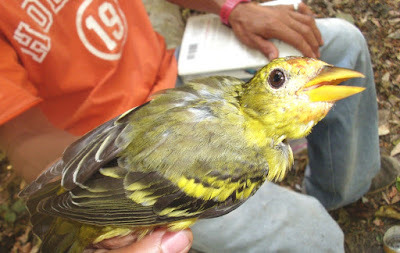 Another family of migratory landbirds consists of the tanagers, which are distributed into multiple families in spite of similar external characteristics. The Western Tanager (Piranga ludovicianus) has recently been placed in the cardinal family (Cardinalidae). It is less common than the Summer Tanager (Piranga rubra), and has a similar but less melodic, more raspy call on its winter habitat. The Western Tanager tends to stay close to the top of tall trees, coming down to lower levels only occasionally, for which we have relatively few capture records. The mature male Western Tanager has a red head which fade to yellow neck and throat and olive-yellow body, over which bold black markings are found on the wings. The females lack red on the head and have fewer wing markings. As in many species, the males attain adult plumage after the first winter season, during which only vestiges of the adult male color pattern are noted. This species prefers more well-developed forest structure in Laguna de Apoyo Nature Reserve. Immature male Western Tanager. Photo Vera Neumann. Not all migratory birds spend winter in Nicaragua and breed further north. One bird which breeds in Nicaragua during the US summer months and then migrates to South America in September is the Sulfur-bellied Flycatcher (Myiodynastes luteiventris). The forests in Laguna de Apoyo Nature Reserve will be punctuated by its squeaky call, which can be compared to a child's squeaky bathroom toy. As a tyrant flycatcher (Family Tyrannidae), it catches insects in flight in open areas, whether above trees in the canopy or over clearings, making sallies from perches at medium or high levels in trees. Sulphur-bellied Flycatcher (Myiodynastes luteiventris). Photo Marlene Krone. The tyrant flycatchers are generally very aggressive birds, vigorously defending nesting territories from any bird or other animal it perceives to be a threat. Among the defense mechanisms is the use of its bright orange mouth, which it displays to frighten any threatening animal. A yellow flash can also be seen on the crest when excited. Sulfur-bellied Flycatcher. Photo Vera Neumann. Migrating birds enjoy a special legal status internationally, thanks to the increasing recognition of the special needs involved in twice-yearly migrations. Among the oldest of legislation to protect wildlife is the Migratory Bird Treaty Act, signed by the US government in 1918. Although Nicaragua is not a co-signatory on this or other, similar legislation, foreign investment may require all the stipulations in this law to be applied, even when the investment is made in Nicaragua.